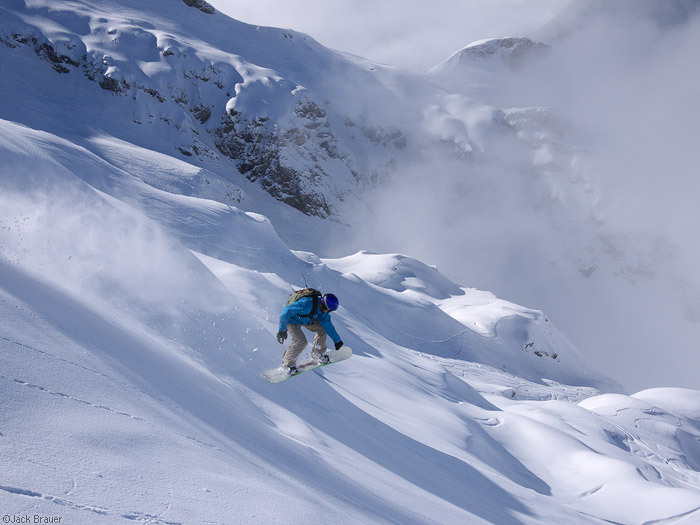 The recent misty, rainy weather down in Engelberg gave way to fresh powder and sunshine up high on Titlis this morning! 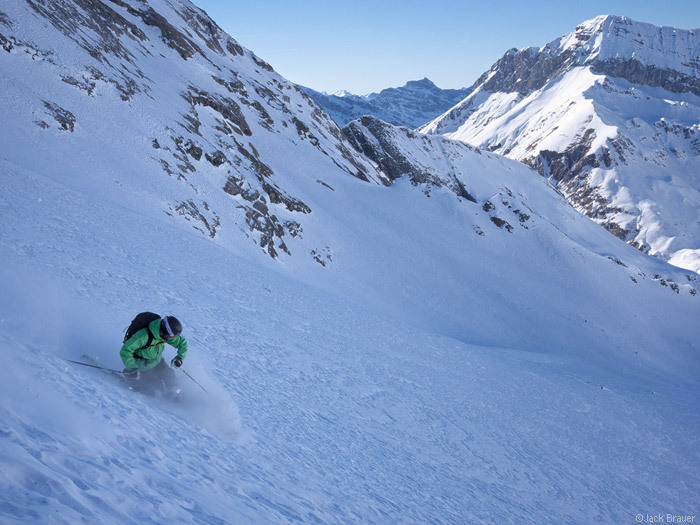 The somewhat heavy powder was perfect for arching fast carves down the Steinberg Glacier. A peek off the rugged backside of Titlis. 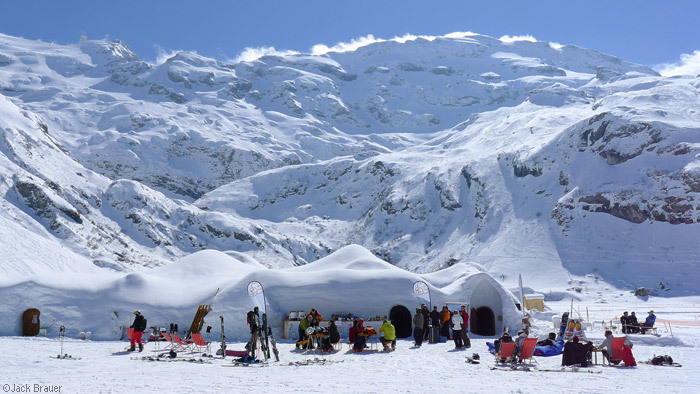 The igloo bar, with a view of the heaps of off-piste on offer, including Titlis and the Steinberg Glacier at upper left. Posted in Alps & Europe, Skiing/Snowboarding and tagged Engelberg, Switzerland on March 18, 2011 May 19, 2013 by Jack Brauer. 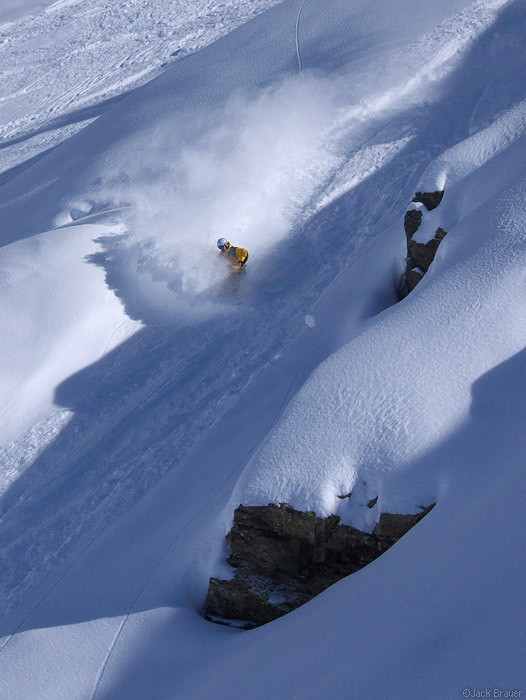 Still scoring powder in Engelberg! 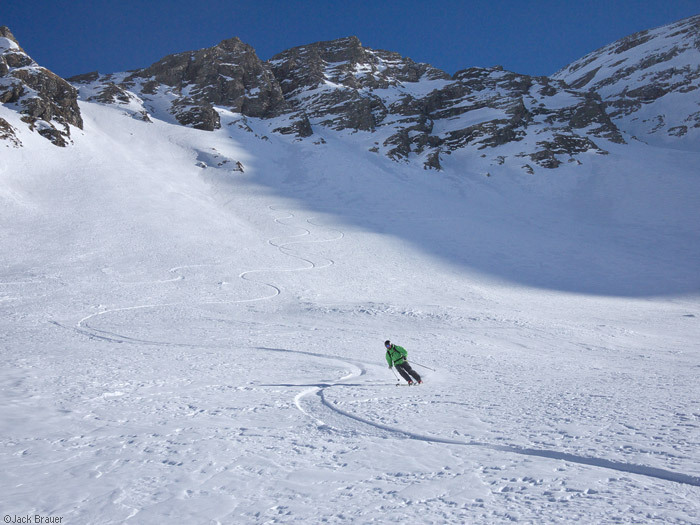 Monday offered an alltime powder day, with 30cm of fresh and bluebird skies above the inversion clouds. Tuesday offered more fresh tracks for those of us willing to hike a bit above the ski area lifts. I’m loving it here lately! At the top of the line, with an impressive spire overhead. 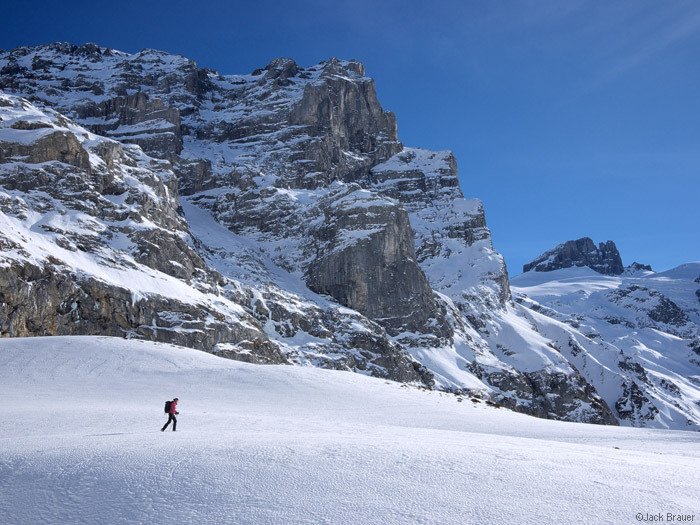 Posted in Alps & Europe, Skiing/Snowboarding and tagged Engelberg, Switzerland on March 1, 2011 May 19, 2013 by Jack Brauer. 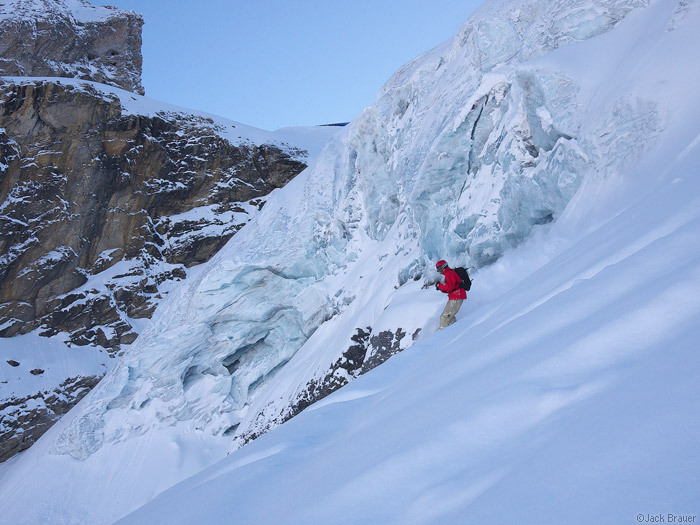 Santos Goicoechea catches some air on the Steinberg Glacier at Engelberg. 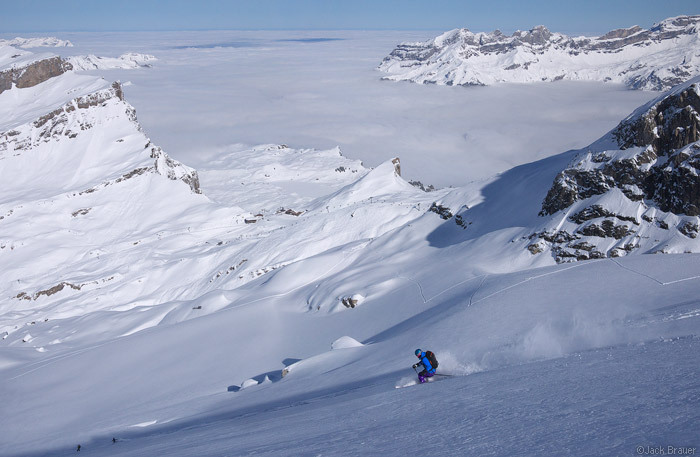 Posted in Alps & Europe, Skiing/Snowboarding and tagged Engelberg, Switzerland on February 25, 2011 May 19, 2013 by Jack Brauer. 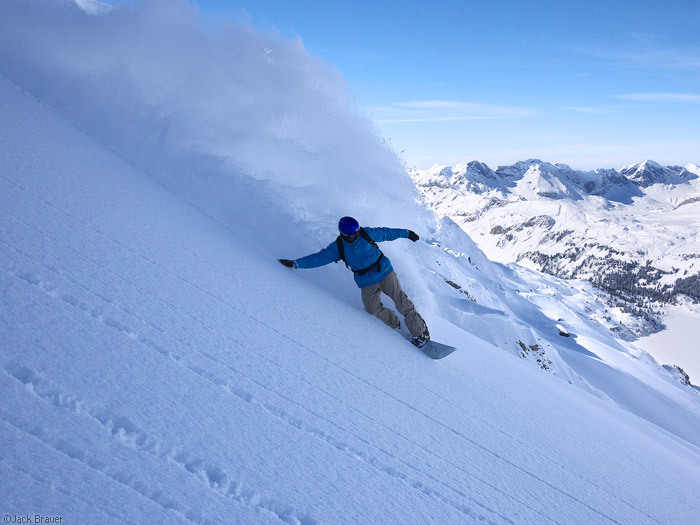 Powder Days Are Here Again! 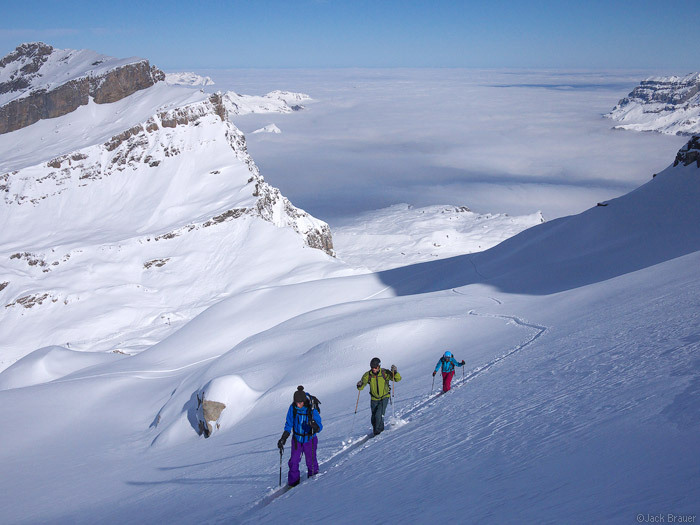 Snowboarding down the Steinberg Glacier in Engelberg. Rider: Mikel Goicoechea. 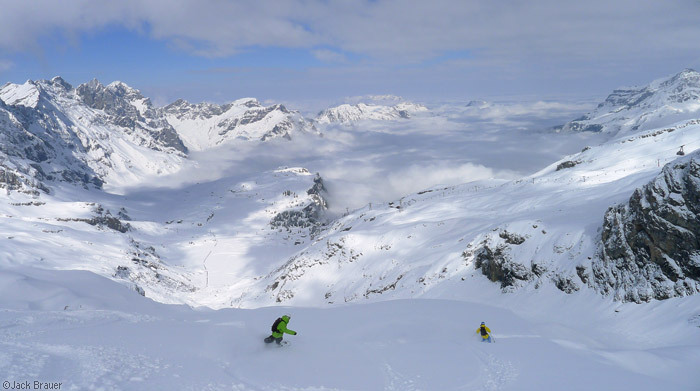 Posted in Alps & Europe, Skiing/Snowboarding and tagged Engelberg, Switzerland on February 24, 2011 May 19, 2013 by Jack Brauer. 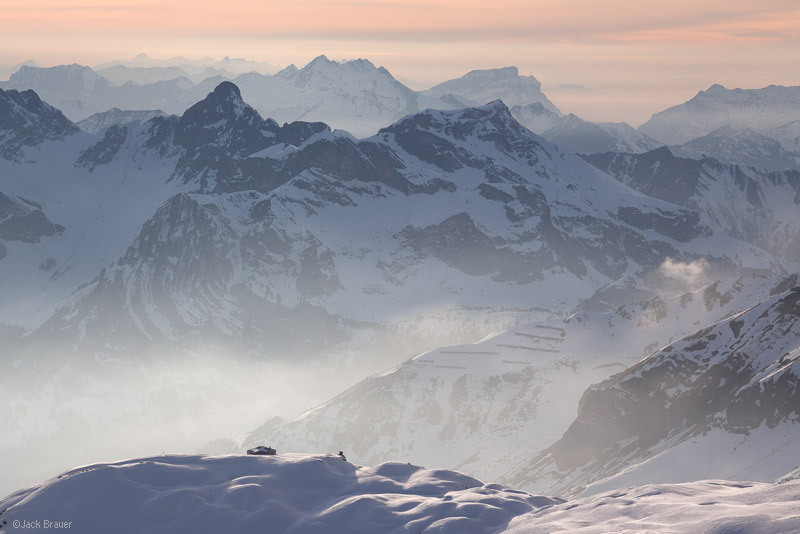 The Rugghubel alpine hut sits on a snowy ridge above Engelberg, with a hazy Swiss Alps backdrop - February. Yesterday I hiked up to the Griessental valley, a photogenic alpine valley that I vowed to return to after seeing it the first time during the Brunistock traverse a few weeks ago. 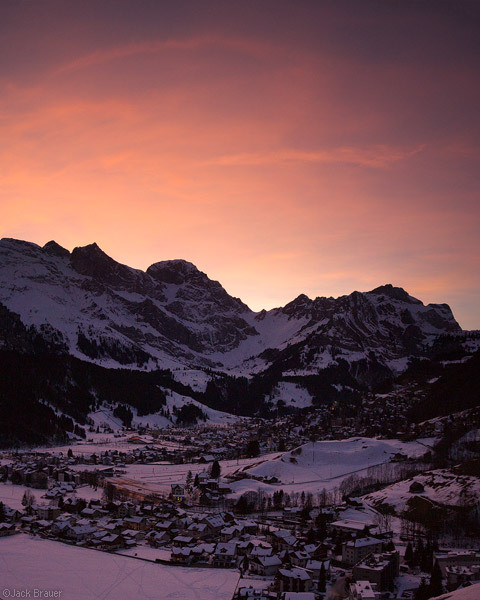 This valley is directly above the town of Engelberg; in fact you can see the Rugghubelhütte (above) from town! Alpenglow light illuminates the snow-filled valley of Griessental, February. See a wider version of this one here (Tough to decide which one I prefer). Full moon light illuminates Ruchstock (2812m) and Hasenstock, February. In this 30-second exposure, at the left is the last light of dusk, and at the right is the glow of city lights under low cloud cover. 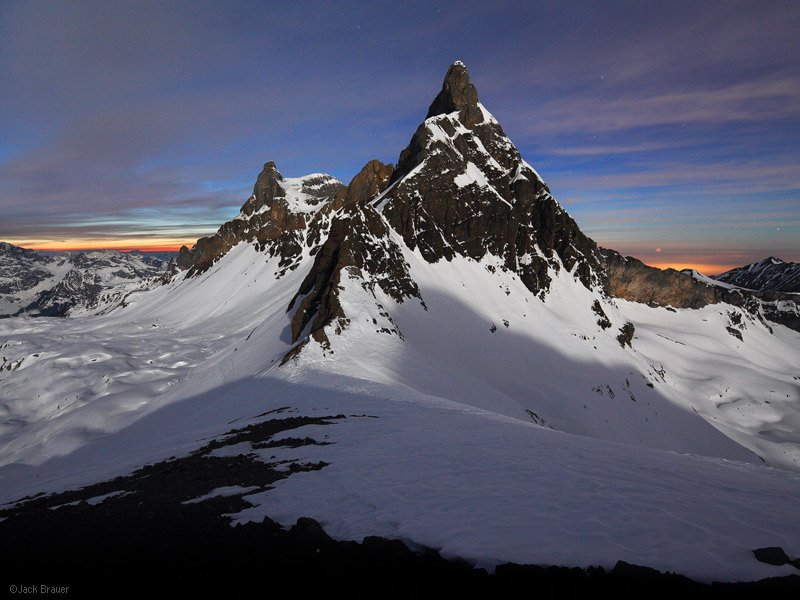 Posted in Alps & Europe, Backpacking & Trekking and tagged Engelberg, Switzerland on February 18, 2011 May 19, 2013 by Jack Brauer. 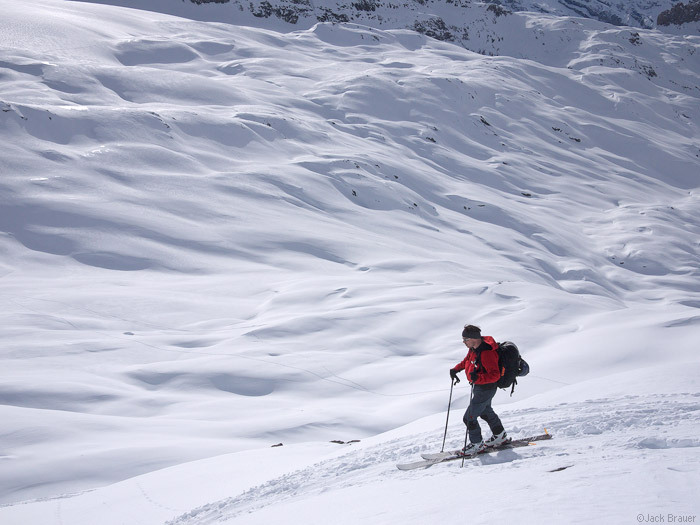 Today I met up with a skier from Montana for a ski/splitboard tour near Engelberg. 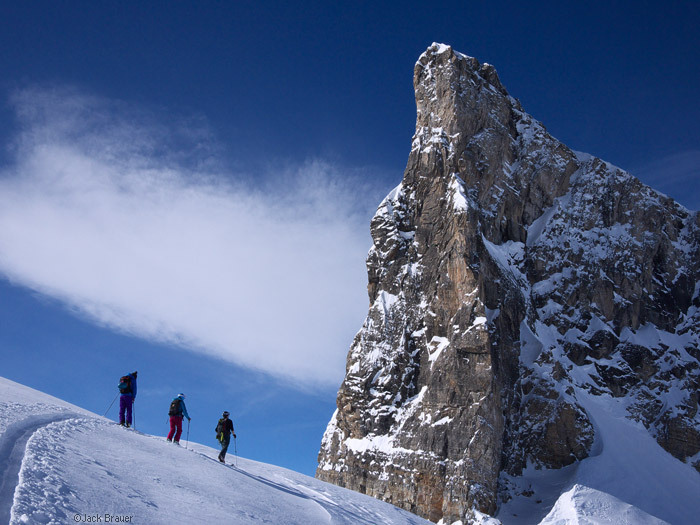 I had scoped some north facing lines during Sunday’s hike up the Surenen valley, and I thought they would offer the best potential for any remaining powder after nearly three weeks of blue skies since the last storm. 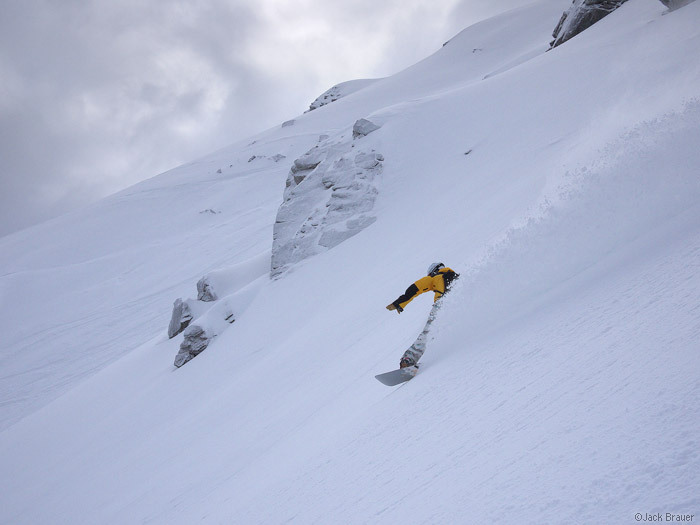 We skinned up the valley and of course we chose to go for the highest couloir there! The snow was promising on the way up, but as we got higher into the couloir it turned to hard icy snow. After pounding steps into the slope for a few hundred feet, without crampons or ice axes, we decided that it just wasn’t happening! A crusty descent took us back down out of the couloir, and then we scored some nice turns down the open slope of smooth old wind-rippled powder. Looking back up at our carves down the nice section. We had come out of the couloir at top right. All in all it was about an 1800′ descent, with probably the best (or should I say “most decent”) snow left around here. 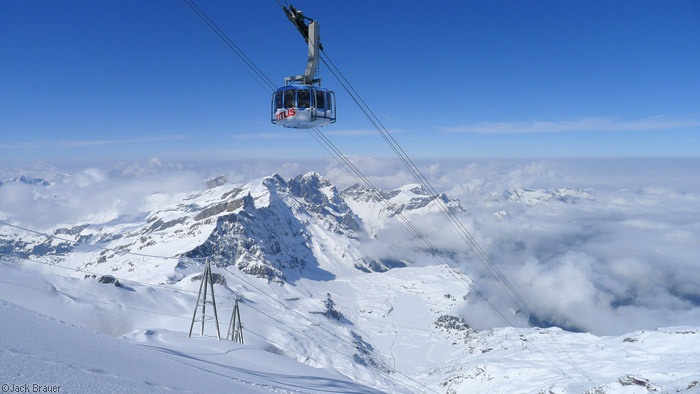 Posted in Alps & Europe, Skiing/Snowboarding and tagged Engelberg, Switzerland on February 9, 2011 May 19, 2013 by Jack Brauer. Shoeshoeing under the rugged west face of Schlossberg (3132m), which rises nearly 4,700 vertical feet overhead. Claudia and I took a hike up the Surenen valley on Sunday. This is the main valley that continues past Engelberg, quickly becoming deeply entrenched amongst towering glaciated mountain walls, eventually culminating in the massively broad cloverleaf basin of Blacken. You can see an entirely different view of Schlossberg from higher up here. Here’s a panoramic view of the west side of Blacken, as seen from a small chapel in the center of the basin where we spent an hour or so eating lunch and relaxing in the sun. Titlis is peeking out at the far left. 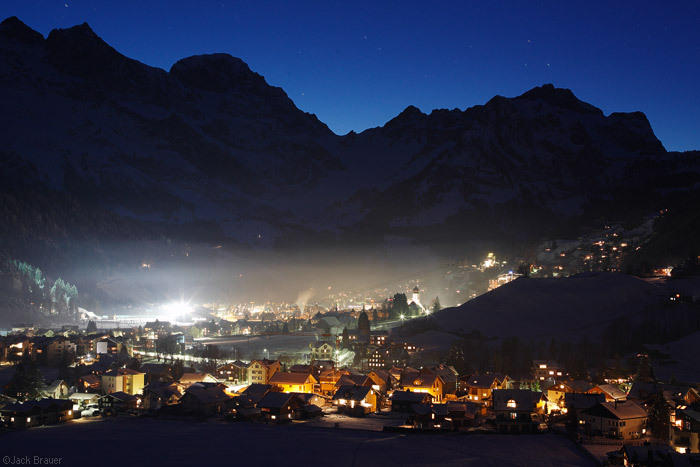 Posted in Alps & Europe and tagged Engelberg, Switzerland on February 7, 2011 May 19, 2013 by Jack Brauer. 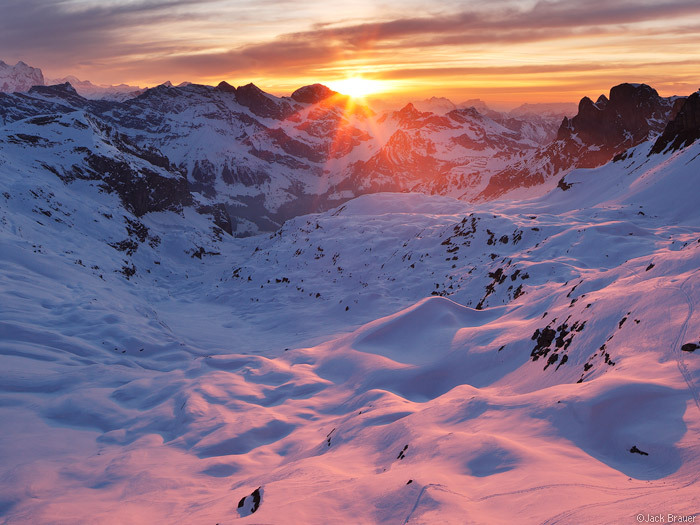 A glowing sunset above Engelberg - February. Wine and cheese with a lovely girl and a glowing sunset over the Swiss Alps. Life is good! 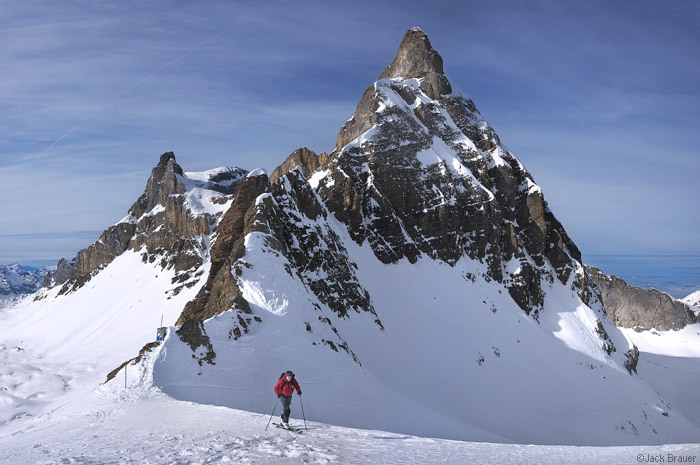 Skier under the rugged spire of Hasenstock (2729m). 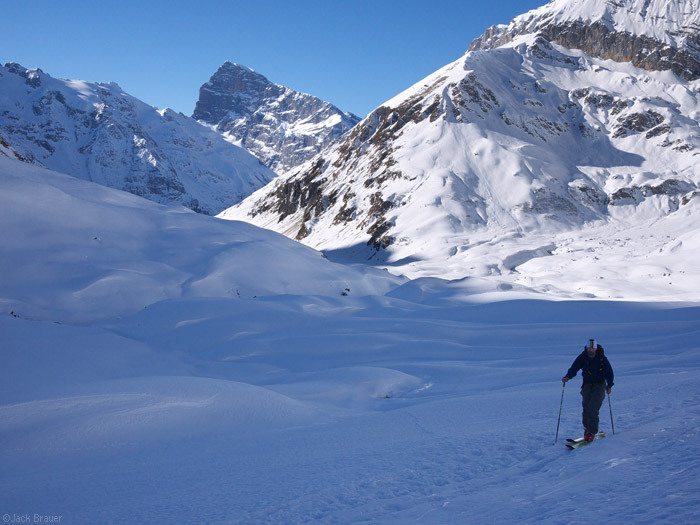 Last Thursday I joined Kevin, an Engelberg-American pal, for a high ski/splitboard traverse through the rugged peaks north of Engelberg. We traveled through seven basins, crossing over 3 glaciers and 4 high passes along the way, with a long descent at the end. Posted in Alps & Europe, Skiing/Snowboarding and tagged Engelberg, Switzerland on February 7, 2011 May 19, 2013 by Jack Brauer. 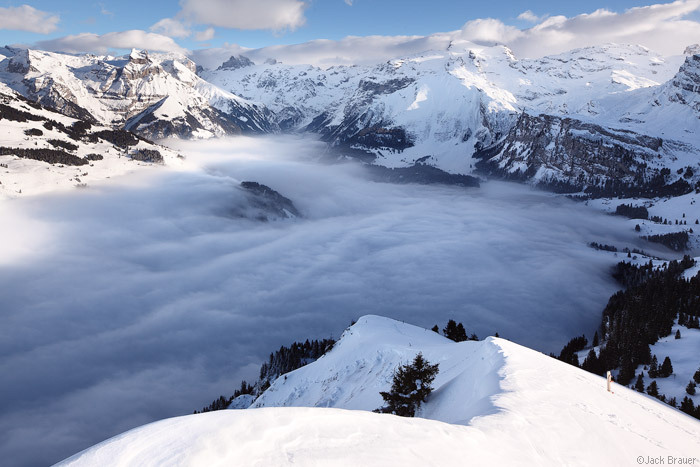 Low clouds flow into the Engelberg valley, as seen from the top of Salistock (1896m). Titlis and the ski area are the mountains towards the right half of the photo. 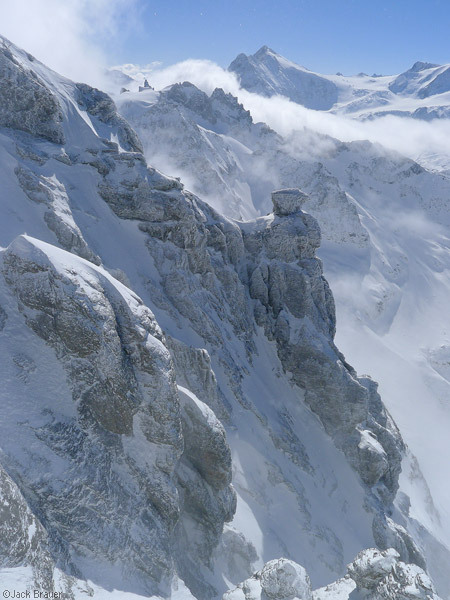 Posted in Alps & Europe and tagged Engelberg, Switzerland on January 31, 2011 May 19, 2013 by Jack Brauer.